"Dagao" redirects here. For the ethnic group, see Dagaaba people. For the former county, see Kaohsiung County. Kaohsiung (/ˌkaʊˈʃʌŋ/; Mandarin Chinese: [káuɕʊ̌ŋ] ( listen); Hokkien POJ: Ko-hiông; Hakka PFS: Kô-hiùng; old names: Takao, Takow, Takau) is a coastal city in southern Taiwan. It is officially a special municipality with an area of 2,952 km2 (1,140 sq mi) stretching from the coastal urban centre to the rural Yushan Range. As of 2018, the municipality has a population of 2.77 million, making it the third most populous administrative division in Taiwan. Since founding in the 17th century, Kaohsiung has grown from a small trading village into the political and economic centre of southern Taiwan, with key industries such as manufacturing, steel-making, oil refining, freight transport and shipbuilding. It is classified as 'High Sufficiency' by GaWC, with some of the most prominent infrastructures in Taiwan. The Port of Kaohsiung is the largest and busiest harbour in Taiwan while Kaohsiung International Airport is the second busiest airport in number of passengers. The city is well-connected to other major cities by high speed and conventional rail, as well as several national freeways. It also hosts the Republic of China Navy fleet headquarters and its naval academy. More recent public works such as Pier-2 Art Center, National Kaohsiung Center for the Arts and Kaohsiung Music Center have been aimed at growing the tourism and cultural industries of the city. Hoklo immigrants to the area during the 16th and 17th centuries called the region Takau (Chinese: 打狗; Pe̍h-ōe-jī: Tá-káu). The surface meaning of the associated Chinese characters was "beat the dog". According to one theory, the name Takau originates from the aboriginal Siraya language and translates as "bamboo forest". According to another theory, the name evolved via metathesis from the name of the Makatao tribe, who inhabited the area at the time of European and Hoklo settlement. The Makatao are considered to be part of the Siraya tribe. During the Dutch colonization of southern Taiwan, the area was known as Tancoia to the western world for a period of about three decades. [specify] In 1662, the Dutch were expelled by the Kingdom of Tungning, founded by Ming loyalists of Koxinga. His son, Zheng Jing, renamed the village Banlian-chiu (Chinese: 萬年州; Pe̍h-ōe-jī: Bān-liân-chiu; literally: 'ten-thousand-year region (zhou)') in 1664. The name of "Takau" was restored in the late 1670s, when the town expanded drastically with immigrants from mainland China, and was kept through Taiwan's cession to the Japanese Empire in 1895. In his 1903 general history of Taiwan, US Consul to Formosa James W. Davidson relates that "Takow" was already a well-known name in English. In 1920, the name was changed to Takao (Japanese: 高雄, after Takao (Kyoto) [ja]) and administered the area under Takao Prefecture. While the new name had quite a different surface meaning, its pronunciation in Japanese sounded more or less the same as the old name spoken in Hokkien. After Taiwan was handed to the Republic of China, the name did not change, but the official romanization became "Kaohsiung" (pinyin: Gāoxióng) after the Standard Chinese pronunciation of 高雄. The name Takau remains the official name of the city in Austronesian languages of Taiwan such as Rukai, although these are not widely spoken in the city. The name also remains popular locally in the naming of businesses, associations, and events. The written history of Kaohsiung can be traced back to the early 17th century, through archaeological studies have found signs of human activity in the region from as long as 7,000 years ago. Prior to the 17th century, the region was inhabited by the Makatao people of the Siraya tribe, who settled on what they named Takau Isle (translated to 打狗嶼 by Ming Chinese explorers); "Takau" meaning "bamboo forest" in the aboriginal language. The earliest evidence of human activity in the Kaohsiung area dates back to roughly 4,700–5,200 years ago. Most of the discovered remnants were located in the hills surrounding Kaohsiung Harbor. Artifacts were found at Shoushan, Longquan Temple, Taoziyuan, Zuoying, Houjing, Fudingjin and Fengbitou. The prehistoric Dapenkeng, Niuchouzi, Dahu, and Niaosong civilizations were known to inhabit the region. Studies of the prehistoric ruins at Longquan Temple have shown that that civilization occurred at roughly the same times as the beginnings of the aboriginal Makatao civilization, suggesting a possible origin for the latter. Unlike some other archaeological sites in the area, the Longquan Temple ruins are relatively well preserved. Prehistoric artifacts discovered have suggested that the ancient Kaohsiung Harbor was originally a lagoon, with early civilizations functioning primarily as hunter-gatherer societies. Some agricultural tools have also been discovered, suggesting that some agricultural activity was also present. It is unknown when the barbarians (Taiwanese aborigines) arose on this island in the ocean beyond Penghu, but they are present at Keeong Harbor (nowaday's Budai, Chiayi), the bay of Galaw (Anping, Tainan), Laydwawan (Tainan City), Yaw Harbor (Cheting, Kaohsiung), Takau Isle (Kaohsiung City), Little Tamsui (Donggang, Pingtung), Siangkeykaw (Puzi, Chiayi), Gali forest (Jiali District, Tainan), the village of Sabah (Tamsui, Taipei), and Dwabangkang (Bali, New Taipei City). Taiwan became a Dutch colony in 1624, after the Dutch East India Company was ejected from Penghu by Ming forces. At the time, Takau was already one of the most important fishing ports in southern Taiwan. The Dutch named the place Tankoya, and the harbor Tancoia. The Dutch missionary François Valentijn named Takau Mountain "Ape Berg", a name that would find its way onto European navigational charts well into the 18th century. 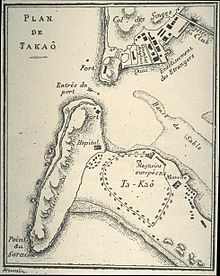 Tankoia was located north of Ape's Hill and a few hours south from Tayouan (modern-day Anping, Tainan) by sail. At the time, a wide shallow bay existed there, sufficient for small vessels. However, constant silting changed the coastline. During this time, Taiwan was divided into five administrative districts, with Takau belonging to the southernmost district. In 1630, the first large scale immigration of Han Chinese to Taiwan began due to famine in Fujian, with merchants and traders from China seeking to purchase hunting licenses from the Dutch or hide out in aboriginal villages to escape authorities in China. In 1684, the Qing dynasty annexed Taiwan and renamed the town Fengshan County (Chinese: 鳳山縣; pinyin: Fèngshān Xiàn), considering it a part of Taiwan Prefecture. It was first opened as a port during the 1680s and subsequently prospered fairly for generations. In 1895, Taiwan was ceded to Japan as part of the Treaty of Shimonoseki. Administrative control of the city was moved from New Fongshan Castle to the Fongshan Sub-District of Tainan Chō (臺南廳). In November 1901, twenty chō were established in total; Hōzan Chō (鳳山廳) was established nearby. In 1909, Hōzan Chō was abolished, and Takow was merged into Tainan Chō. In 1920, during the tenure of 8th Governor-General Den Kenjirō, districts were abolished in favor of prefectures. Thus the city was administered as Takao City (高雄市, Takao-shi) under Takao Prefecture. The Japanese developed Takao, especially the harbor that became the foundation of Kaohsiung to be a port city. Takao was then systematically modernized and connected to the end of North-South Railway. Kaohsiung Harbor was also developed starting from 1894. The city center was relocated several times during the period due to the government's development strategy. Development was initially centered on Ki-au (Chinese: 旗後; Pe̍h-ōe-jī: Kî-āu) region but the government began laying railways, upgrading the harbor, and passing new urban plans. New industries such as refinery, machinery, shipbuilding and cementing were also introduced. Before and during World War II it handled a growing share of Taiwan's agricultural exports to Japan, and was also a major base for Japan's campaigns in Southeast Asia and the Pacific. Extremely ambitious plans for the construction of a massive modern port were drawn up. Toward the end of the war, the Japanese promoted some industrial development at Kaohsiung, establishing an aluminum industry based on the abundant hydroelectric power produced by the Sun Moon Lake project in the mountains. The city was heavily bombed by Task Force 38 and FEAF during World War II between 1944-1945. After control of Taiwan was handed over from Japan to the government of the Republic of China on 25 October 1945, Kaohsiung City and Kaohsiung County were established as a provincial city and a county of Taiwan Province respectively on 25 December 1945. The official romanization of the name came to be "Kaohsiung", based on the Wade–Giles romanization of the Mandarin reading of the kanji name. Kaohsiung City then consisted of 10 districts, which were Gushan, Lianya (renamed "Lingya" in 1952), Nanzi, Cianjin, Cianzhen, Cijin, Sanmin, Sinsing, Yancheng, and Zuoying. During this time, Kaohsiung developed rapidly. The port, badly damaged in World War II, was restored. It also became a fishing port for boats sailing to Philippine and Indonesian waters. Largely because of its climate, Kaohsiung overtook Keelung as Taiwan's major port. Kaohsiung also surpassed Tainan to become the second largest city of Taiwan in the late 1970s and Kaohsiung City was upgraded from a provincial city to special municipality on 1 July 1979, by the Executive Yuan with a total of 11 districts. The additional district is Siaogang District, which was annexed from Siaogang Township of Kaohsiung County. The Kaohsiung Incident, where the government suppressed a commemoration of International Human Rights Day, occurred on December 10, 1979. Since then, Kaohsiung gradually grew into a political center of the Pan-Green population of Taiwan, in opposition to Taipei where the majority population is Kuomintang supporters. On December 25, 2010, Kaohsiung City merged with Kaohsiung County to form a larger special municipality with Lingya District and Fengshan District becoming the capital city, ending the administration of Kaohsiung County. On 31 July 2014, a series of gas explosions occurred in the Cianzhen and Lingya Districts of the city, killing 31 and injuring more than 300. Five roads were destroyed in an area of nearly 20 square kilometres (7.7 square miles) near the city center. It was the largest gas explosion in Taiwan's modern history. 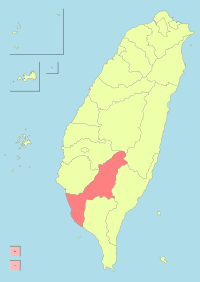 The city sits on the southwestern coast of Taiwan facing the Taiwan Strait, bordering Tainan City to the north, Chiayi and Nantou County to the northwest, Taitung County to its northeast and Pingtung County to the south and southeast. The downtown areas are centered on Kaohsiung Harbor with Qijin Island on the other side of the harbor acting as a natural breakwater. The Love River (Ai River) flows into the harbor through the Old City and downtown. Zuoying Military Harbor lies to the north of Kaohsiung Harbor and the city center. Kaohsiung's natural landmarks include Ape Hill and Mount Banping. Located about a degree south of the Tropic of Cancer, Kaohsiung has a tropical savanna climate (Köppen Aw), with monthly mean temperatures between 20 and 29 °C (68 and 84 °F) and relative humidity ranging between 71 and 81%. Kaohsiung's warm climate is very much dictated by its low latitude and its exposure to warm sea temperatures year-round, with the Kuroshio Current passing by the coast of southern Taiwan, and the Central mountain range on the northeast blocking out the cool northeastern winds during the winter. The city, therefore, has a noticeably warmer climate than nearby cities located at similar latitudes such as Hong Kong, Guangzhou as well as various cities further south of northern Vietnam, such as Hanoi. Although the climate is classified as tropical, Kaohsiung has a defined cooler season unlike most other cities in Asia classified with this climate but located closer to the equator such as Singapore or Manila. Daily maximum temperature typically exceeds 30 °C (86 °F) during the warmer season (April to November) and 25 °C (77 °F) during the cooler season (December to March), with the exception when cold fronts strikes during the winter months, when the daily mean temperature of the city can drop between 3 to 5 °C (5.4 to 9.0 °F) depending on the strength of the cold front. Also, besides the high temperatures occurring during the usual summer months, daytime temperatures of inland districts of the city can often exceed above 33 °C (91 °F) from mid-March to late April before the onset of the monsoon season, with clear skies and southwesterly airflows. Average annual rainfall is around 1,885 millimetres (74.2 in), focused primarily from June to August. At more than 2,210 hours of bright sunshine, the city is one of the sunniest areas in Taiwan. The sea temperature of Kaohsiung Harbor remains above 22 °C (72 °F) year-round, the second highest of Southern Taiwan after Liuqiu island. According to recent records, the average temperature of the city has risen around 1 degree Celsius over the past 3 decades, from about 24.2 °C (75.6 °F) in 1983 to around 25.2 °C (77.4 °F) by 2012. Kaohsiung's skyline viewed from Kaohsiung Lighthouse in Cijin District, with the 85 Sky Tower right of center. 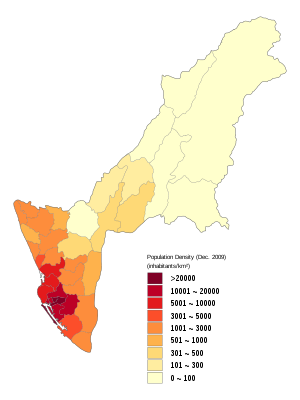 Source: "Populations by city and county in Taiwan". Ministry of the Interior Population Census. As of December 2018, Kaohsiung city has a population of 2,773,533 people, making it the third largest city after Taipei and Taichung, and a population density of 939.59 people per square kilometer. Within the city, Fongshan District is the most populated district with a population of 359,519 people, while Xinxing District is the most densely populated district with a population density of 25,820 people per square kilometer. As in most Taiwanese cities or counties, the majority of the population are Han Taiwanese. The Hans are then divided into 3 subgroups, Hoklo, Hakka, and Waishengren. The Hoklo and Waishengren mostly live in flatland townships and the city centre, while the majority of the Hakka population live in the suburbs or rural townships of the northeastern hills. The Taiwanese aborigines of Kaohsiung, who belong to various ethnic groups that speak different languages belonging to the Austronesian language family similar/related to those of Maritime Southeast Asia and Oceania, mostly live in the mountain townships such as Taoyuan or Namasia. The main aboriginal groups living within the city center include the Bunun, Rukai, Tsou and the Kanakanavus. As of December 2010, Kaohsiung city hosts around 21,000 foreign spouses. Around 12,353 are Mainland Chinese, 4,244 are Vietnamese, around 800 Japanese and Indonesians and around 4,000 other Asians or foreigners from Europe or the Americas. As of April 2013, Kaohsiung hosts 35,074 foreign workers who mainly work as factory workers or foreign maids (not including foreign specialists such as teachers and other professionals). Within around half of which are Indonesians, and the other half being workers from other Southeast Asian countries mainly from Vietnam, the Philippines or Thailand. Kaohsiung is a major international port and industrial city in the southwest of Taiwan. As an exporting center, Kaohsiung serves the agricultural interior of southern Taiwan, as well as the mountains of the southeast. Major raw material exports include rice, sugar, bananas, pineapples, peanuts (groundnuts) and citrus fruits. The 2,200-hectare (5,400-acre) Linhai Industrial Park, on the waterfront, was completed in the mid-1970s and includes a steel mill, shipyard, petrochemical complex, and other industries. The city has an oil refinery, aluminum and cement works, fertilizer factories, sugar refineries, brick and tile works, canning factories, salt-manufacturing factories, and papermaking plants. Designated an export-processing zone in the late 1970s, Kaohsiung also attracted foreign investment to process locally purchased raw materials for export. The ongoing Nansing Project is a plan to reclaim 250 hectares (620 acres) of land along the coast by 2011. The Kaohsiung Harbor Bureau plans to buy 49 hectares of the reclaimed land to establish a solar energy industrial district that would be in the harbor's free trade zone. The gross domestic product (GDP) in nominal terms of Kaohsiung City is estimated to be around US$45 billion, and US$90 billion for the metropolitan region. As of 2008[update], the GDP per capita in nominal terms was approximately US$24,000. Despite early success and heavy governmental investment, the city suffers from the economic north–south divide in Taiwan, which continues to be the centre of political debate. There has been public aims to shift the local economy towards tourism and cultural industries, with projects such as Pier-2 Art Center, National Kaohsiung Center for the Arts and Kaohsiung Music Center. The main agricultural produce in Kaohsiung are vegetables, fruits and rice with a he total arable land of 473 km2, which accounts to 16% of the total area of the municipality. Kaohsiung has the highest production of guava, jujube and lychee in Taiwan. The main animal husbandry are chicken, dairy cattle, deer, duck, goose, pigs and sheep. The total annual agricultural outcome in Kaohsiung is NT$24.15 billion. Main landmarks of Kaohsiung city include the 85 Sky Tower, the ferris wheel of the Kaohsiung Dream Mall, the Kaohsiung Arena and Kaohsiung Harbor. The newly developed city is also known for having a large number of shopping streets, organized night markets and newly developed leisure parks such as the Pier-2 Art Center, E-DA Theme Park, Metropolitan Park, the Kaohsiung Museum of Fine Arts and Taroko Park. Natural attractions of the city include Shoushan (Monkey mountain), the Love River, Cijin Island, Sizihwan, the Dapingding Tropical Botanical Garden and Yushan National Park at the northeastern tip of the city. The city also features various historical attractions such as the Old City of Zuoying, a historical town built during the early 17th century, the Former British Consulate at Takao built during the late 19th century, and various sugar and crop factories built during the Japanese occupation of Taiwan. Kaohsiung city includes a wide range of different natural attractions due to its large size and geographical variation, as it is bordered by the Central Mountain Range in the northeast and the warm South China Sea to the west and southwest. The year-round warm climate allows coral reefs to grow along the coasts around Kaohsiung Harbor, with Shoushan Mountain being a small mountain completely made up of coral reefs and calcium carbonate, while the mountainous districts in the northeast include Taiwan's highest mountain, Yushan. Other notable natural attractions include the Mount Banping, Lotus Lake, and Dongsha Atoll National Park, which is currently inaccessible by the public due to military occupation. A large number of historical sites and monuments were left in the city after the colonization of the Dutch in the 17th century, the Qing dynasty during the 18th and 19th century and the Japanese empire from the late 19th century to the mid 20th century. The city government has protected various sites and monuments from further damage and many have been opened to the public since the early 1980s. Notable historical sites include the Cemetery of Zhenghaijun, Former British Consulate at Takao, Former Dinglinzihbian Police Station, Meinong Cultural and Creative Center, Former Sanhe Bank, and the Cihou Lighthouse, one of the oldest lighthouses of the city. Kaohsiung is home to many museums, including the Chung Li-he Museum, Cijin Shell Museum, Jiaxian Fossil Museum, Kaohsiung Astronomical Museum, Kaohsiung Hakka Cultural Museum, Kaohsiung Harbor Museum, Kaohsiung Museum of Fine Arts, Kaohsiung Museum of History, Kaohsiung Museum of Labor, Kaohsiung Vision Museum, Meinong Hakka Culture Museum, National Science and Technology Museum, Republic of China Air Force Museum, Soya-Mixed Meat Museum, Taiwan Sugar Museum, Takao Railway Museum and YM Museum of Marine Exploration Kaohsiung. As the largest municipality in Taiwan, Kaohsiung has a number of newly built leisure areas and parks. Notable parks or pavilions in the city include the Central Park, Siaogangshan Skywalk Park, Fo Guang Shan, the Dragon and Tiger Pagodas, the Love Pier, Singuang Ferry Wharf and Kaohsiung Fisherman's Wharf. Kaohsiung is home to many night markets, such as Jin-Zuan Night Market, Liuhe Night Market Ruifeng Night Market and Zhonghua Street Night Market, and the Kaisyuan Night Market. Other attractions include the Dome of Light of Kaohsiung MRT's Formosa Boulevard Station, the Kaohsiung Mosque and the Tower of Light of Sanmin District. The majority of those living in Kaohsiung can communicate in both Taiwanese Hokkien and Standard Chinese. Some of the elderly who grew up during the Japanese colonization of Taiwan can communicate in Japanese, while most of the younger population has basic English skills. Since the spread of Standard Chinese after the Nationalist Government retreated to Taiwan in 1949, Hakka Chinese and various Formosan languages are gradually no longer spoken with the new generation and many Formosan languages are therefore classified as moribund or endangered languages by the United Nations. Nowadays, only elder Hakka people mostly living in Meinong, Liouguei, Shanlin and Jiasian districts can communicate in Hakka and elder Taiwanese aborigines living mostly in the rural districts of Namasia and Taoyuan can communicate with the aboriginal languages. The Taiwanese government has established special affairs committees for both the Aboriginals and the Hakkas to protect their language, culture, and minority rights. Kaohsiung has rich resources of ocean, mountains and forests which shape a unique and active multi-faceted art and cultural aesthetic in public infrastructure and transport, public art, and city architecture, from MRT stations and city space to art galleries. The "Dome light" in the concourse of Formosa Boulevard Station of Kaohsiung MRT is one of the world's largest public glass works of art. The city also has the Urban Spotlight Arcade spanning along the street in Cianjin District. In October 2018, Weiwuying (the National Kaohsiung Centre for the Arts), designed by Mecanoo, opened. The religious population of Kaohsiung is mainly divided into five main religious groups: Buddhist, Taoist, Muslim and Christian (Catholicism and Protestantism). As of 2015[update], Kaohsiung City has 1,481 temples, the second highest in Taiwan after Tainan. Kaohsiung has also 306 churches. Buddhism is one of the major religions in Taiwan, with over 35% of Taiwan's population identifying as Buddhist. The same applies to Kaohsiung city. Kaohsiung also hosts the largest Buddhist temple in Taiwan, the Foguangshan Temple. Around 33% of the Taiwanese population are Taoist, making it the second largest religion of Taiwan. Most people who believe in Taoism also ascribe to Buddhism at the same time, as the differences and boundaries between the two religions are not always clear. Many residents of the area also worship the folk sea goddess Mazu, who is variously syncretized as a Taoist immortal or avatar of the bodhisattva Guanyin. Her temple on Cijin Island is the oldest in the city, with its original bamboo-and-thatch structure first opened in 1673. The area surrounding it formed the center of the city's early settlement. Christianity is a growing religion in Taiwan. It was first brought onto the island when the Dutch and Spanish colonized Taiwan during the 17th century, mostly to the aboriginals. Kaohsiung currently hosts around 56,000 Christians. Besides the majority population of Buddhists and Taoists, Kaohsiung also includes a rather small population of Muslims. During the Chinese Civil War, some 20,000 Muslims, mostly soldiers and civil servants, fled mainland China with the Kuomintang to Taiwan. During the 1980s, another few thousand Muslims from Myanmar and Thailand, whom are mostly descendants of Nationalist soldiers who fled Yunnan as a result of the communist takeover, migrated to Taiwan in search of a better life, resulting in an increase of Muslim population within the country. More recently, with the rise of Indonesian workers working in Taiwan, an estimated number of 88,000 Indonesian Muslims currently live in the country, in addition to the existing 53,000 Taiwanese Muslims. Combining all demographics, Taiwan hosts around 140,000 Muslims, with around 25,000 living in Kaohsiung. Kaohsiung Mosque is the largest mosque in Kaohsiung and the main gathering site of Muslims within the city. Han Kuo-yu, the incumbent Mayor of Kaohsiung. Sometimes Kaohsiung used to be seen as the political opposite Taipei. While northern Taiwan leans towards the Pan-Blue Coalition in the state-level elections, southern Taiwan, including Kaohsiung, leaned towards the Pan-Green Coalition since the late 1990s. Frank Hsieh of the Democratic Progressive Party was reelected twice as Mayor of Kaohsiung, where he was widely credited for transforming the city from an industrial sprawl into an attractive modern metropolis. Hsieh resigned from the office of mayor to take up the office of Premier of the Republic of China in 2005. 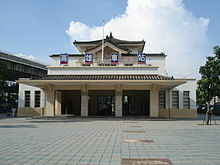 The municipal election, held on December 9, 2006, resulted in a victory for the Democratic Progressive Party's candidate Chen Chu, the first elected female mayor of special municipality in Taiwan, defeating her Kuomintang rival and former deputy mayor, Huang Chun-ying. The current mayor of Kaohsiung City is Han Kuo-yu of the Kuomintang. Kaohsiung is directly divided into 35 districts and 3 mountain indigenous districts. There are a total of 651 villages in which each village is subdivided into neighborhoods (鄰). There are 18,584 neighborhoods in Kaohsiung City. Lingya and Fengsha districts are the administrative centers of the city while Lingya and Xinxinging Districts are the two most densely populated districts of the city. Kaohsiung has the most numbers of districts among other special municipalities in Taiwan. Northern portion of Kaohsiung harbor viewed from Cijin island lighthouse hill. A major port, through which pass most of Taiwan's marine imports and exports, is located at the city but is not managed by the city government. Also known as the "Harbour Capital" of Taiwan, Kaohsiung has always had a strong link with the ocean and maritime transportation. Ferries play a key role in everyday transportation, especially for transportation across the harbour. With five terminals and 23 berths, the Port of Kaohsiung is Taiwan's largest container port and the 13th largest in the world. In 2007 the port reached its handling capacity with a record trade volume of 10.2 million twenty-foot equivalent units (TEU). A new container terminal is under construction, increasing future handling capacity by 2 million TEU by 2013. The Port of Kaohsiung is not officially a part of Kaohsiung City, instead it is administrated by Kaohsiung Port Authority, under Ministry of Transportation. There is a push for Kaohsiung City to annex the Port of Kaohsiung in order to facilitate better regional planning. Kaohsiung is one of the biggest ports in the world for importing shark fins, sold at high prices in the restaurants and shops of Taiwan and China. They are brought in from overseas and are placed out to dry in the sun on residential rooftops near the port. Kaohsiung City is also home to Taiwan's second largest international airport, the Kaohsiung International Airport, located in Siaogang District near the city's center. It one of the three major international airports of Taiwan, serving passengers of the entire southern and southeastern part of the country. However, the size of the airport is relatively small with short runways compared to other major airports of Taiwan due to its age and its location near the city center, making it impossible for large aircraft such as the Airbus A380 to land at the airport. As a result, plans for runway expansion or building a new airport in replacement have been proposed. Kaohsiung Mass Rapid Transit opened for service in March 2008. Notably, two of Kaohsiung's MRT stations, Formosa Boulevard Station and Central Park Station, were ranked among the top 50 most beautiful subway systems in the world by Metrobits.org in 2011. In 2012, the two stations respectively are ranked as the 2nd and the 4th among the top 15 most beautiful subway stops in the world by BootsnAll. The K.R.T. Girls are the official mascots of the system. 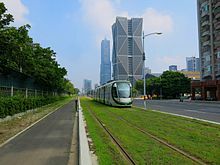 The Circular Light Rail Line (also known as the Kaohsiung LRT, Kaohsiung Tram) for Kaohsiung City is a planned light rail line. Construction of Phase 1, known as the Waterside Light Rail began in June 2013 and is in full operation since September 2017. To combat air pollution, usage of the light rail, was well as buses, was made free of charge for electronic ticket holders from December to February, when air pollution is at its peak. The city is served by the Taiwan Railways Administration's Western Line and Pingtung Line. Taiwan High Speed Rail also serves Kaohsiung City at Zuoying Station in northern Kaohsiung City. The station is an underground station, replacing the old ground level station. Additionally, these two stations are also served by Red Line of Kaohsiung Rapid Transit System. Kaohsiung is home to Taiwan's largest stadium, the National Stadium, and Kaohsiung Arena. National Stadium is Taiwan's largest international-class stadium with a maximum capacity of 55,000 seats. Kaohsiung hosted the 2009 World Games at the National Stadium. Nearly 6,000 athletes, officials, coaches, referees and others from 103 countries participated in the 2009 Kaohsiung World Games. Kaohsiung was also home to the Kaohsiung Truth of the ASEAN Basketball League. They were the first team in the history of the league that was based outside Southeast Asia. The team folded in 2017. 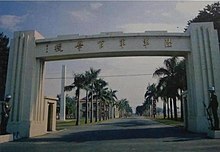 Kaohsiung has a number of colleges and junior colleges offering training in commerce, education, maritime technology, medicine, modern languages, nursing, and technology, as well as various international schools and eight national military schools, including the three major military academies of the country, the Republic of China Military Academy, Republic of China Naval Academy and Republic of China Air Force Academy. The Kaohsiung Exhibition Center, built by the Kaohsiung City Government, was opened on 14 April 2014. It includes an exhibition space for 1,500 booths, and a convention hall for 2,000 pax. The center hosted the Taiwan International Boat Show in May 2014. Another conference and event-related venue is the newly renovated International Convention Center Kaohsiung in 2013. Kaohsiung is twinned with the following locations. ^ 《中華民國統計資訊網》縣市重要統計指標查詢系統網. Statdb.dgbas.gov.tw (in Chinese). Retrieved 11 June 2016. ^ a b "Demographia World Urban Areas PDF (April 2018)" (PDF). Demographia. Retrieved 2016-06-06. ^ 高雄市政府主計處全球資訊網 – 首頁. dbaskmg.kcg.gov.tw (in Chinese). Retrieved 2018-09-09. ^ a b "人口統計查詢：本市各區里戶口數月統計". 高雄市政府民政局. Retrieved 2019-01-04. ^ Davidson, James W. (1903). The Island of Formosa, Past and Present : history, people, resources, and commercial prospects : tea, camphor, sugar, gold, coal, sulphur, economical plants, and other productions. London and New York: Macmillan. p. iii. OCLC 1887893. OL 6931635M. ^ Campbell, William (1903). "Explanatory Notes". Formosa under the Dutch: described from contemporary records, with explanatory notes and a bibliography of the island. London: Kegan Paul. p. 548. OCLC 644323041. ^ "History of Kaohsiung". HotelTravel.com. 1999. Archived from the original on 2014-08-08. Retrieved 2014-08-02. ^ "Discover Kaohsiung > History". Welcome to Kaohsiung City. 2013. ^ What's in changing a name? Archived 2007-06-30 at Archive.today Taiwan Journal Vol. XXVI No. 19 May 15, 2009 "...while name Kaohsiung is technically the Mandarin pronunciation of the Japanese written version of a Holo Taiwanese rendition of an old aboriginal name..."
^ "Many dead in Taiwan city gas blasts". Taiwan's News.Net. Archived from the original on 2014-08-08. Retrieved 2 August 2014. 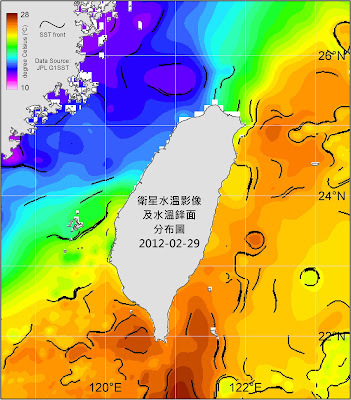 ^ "Taiwan sea temperatures of February 2012". Central Weather Bureau. ^ a b "Climate". Central Weather Bureau. ^ "Kaohsiung Average Sea Temperatures". Central Weather Bureau. ^ "Liuqiu island Average Sea Temperatures". Central Weather Bureau. ^ a b "Kaohsiung City to open solar energy industrial zone". Focus Taiwan News Channel. 2010-06-27. Retrieved 2010-07-09. ^ News, Taiwan. "Major Kaohsiung mayoral candidates face off i..." Taiwan News. Retrieved 11 February 2019. ^ "Current Conditions and Theme for Agriculture". Agriculture Bureau of Kaohsiung City Government. Retrieved 29 March 2019. ^ "Art&Culture". Kaohsiung City Government. Retrieved 2013-07-27. ^ Wainwright, Oliver (2018-10-20). "Grand vision: The world's biggest arts venue opens in Taiwan". The Guardian (53545). London. p. 19. Retrieved 2018-10-21. ^ "Taiwan Yearbook 2006". Government of Information Office. 2006. Archived from the original on 2007-07-08. Retrieved 2007-09-01. ^ Lee Hsin-fang; Chung, Jake (15 Jul 2015). "Tainan has most of nation's 12,106 temples". Taipei Times. p. 5. ^ "Glossary of Names for Admin Divisions" (PDF). placesearch.moi.gov.tw. Ministry of Interior of the ROC. Archived from the original (PDF) on 2015-08-19. Retrieved 18 March 2015. ^ "Top 50 World Container Ports | World Shipping Council". www.worldshipping.org. Retrieved 2019-01-04. ^ a b Dale, Jamie (2008-01-17). "Kaohsiung container port hits full capacity". Lloyd's List Daily Commercial News. Informa Australia. p. 16. ^ "A guide to the fifty most beautiful subway systems in the world". Metrobits.org. 2011-12-01. ^ "15 of the Most Beautiful Subway Stops in the World". BootsnAll. Retrieved 2012-01-29. ^ "Kaohsiung makes public transport free - Taipei Times". www.taipeitimes.com. Retrieved 2017-12-01. ^ "Kaohsiung's new venue". TTGmice. Archived from the original on 5 December 2013. Retrieved 18 January 2013. ^ "Kaohsiung, Panama City forge sister city relations - Politics - FOCUS TAIWAN - CNA ENGLISH NEWS". Focustaiwan.tw. Retrieved 3 December 2017.